I thought I would share a quick tip that saves me time when I’m doing laundry at home or at the lake. I’m probably not alone in NOT loving to do laundry. It seems like an endless and fruitless chore. As soon as I get caught up, there’s more! If you are like me, you have an assortment of bed sizes in your home. We have always have a king size bed for us and either twin, full or queen size beds in the guest room and the boy’s rooms. This can get tricky when trying to wash the sheets at once and match them to the right beds. I came up with a trick a few years ago. Whenever I buy a new blanket, sheets or comforters, I save the heavy zippered plastic bag they come in. I use them in a few ways. In the off season, when I take the blankets off of the beds, I’ll wash and dry them and put them in the pouch they came in originally. I’ll add a dryer sheet and zip it up, label it and store it in the closet of the room which it belongs. This way the blankets are fresh and clean for the next season or an unseasonably cool night. I also use the bags for sheets. 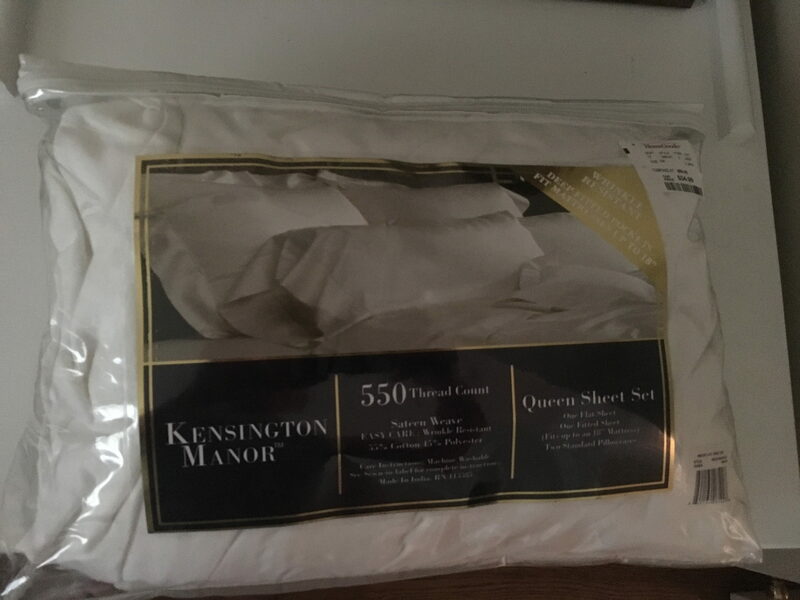 I like to buy nice high thread count cotton sheets or linen sheets when they are on sale. (Kohl’s often has 30% off coupons plus sale prices and makes them very affordable.) This way I have a spare set of sheets for each bed. This really comes in handy at the lake. Whenever guests leave they can strip the beds and I have fresh sheets waiting to go back on that bed. It also helps keep the matching sets together, complete with flat, fitted sheets and pillow cases. I like to mark which room they go in and what size, queen, king, etc. Martha Stewart would probably iron the sheets but that’s not happening here. I fold them fresh out of the dryer and pop them in the bags! If you have back to back guests it helps to have clean sheets waiting in the wings if you don’t have time to wash sheets before they arrive. This is also a great tip for folks with rental properties. Always a set of fresh sheets waiting for the next set of renters! I shared this tip with my sister and she loved it! The dryer sheets help keep the contents smelling fresh. Now if only the sheets would wash themselves…..
How to Hide a Teal Sofa….